QualiMed celebrates the grandest and most colorful Philippine festival – the Dinagyang Festival – in Atria Park District, Iloilo City! 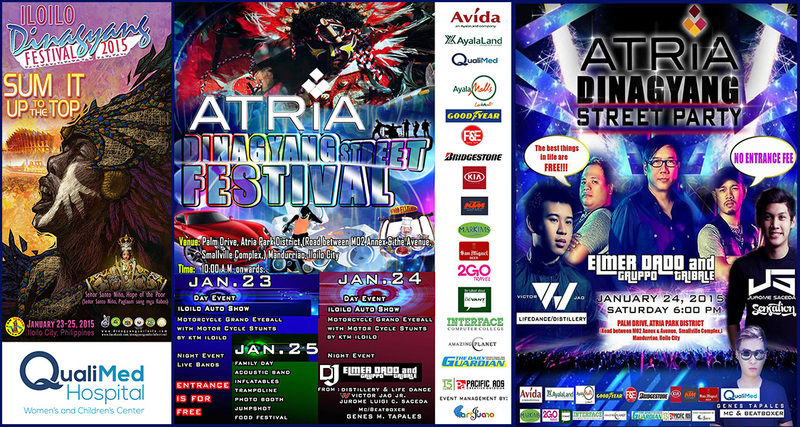 The Atria Dinagyang Street Festival is a three-day event, which includes car and motorcycle shows and stunts, play areas with inflatables and trampoline, food festival, and live bands. QualiMed Hospital – Women’s and Children’s Center joins as event medic for this year’s celebration. The Dinagyang street fest runs from January 23-25, 2015 at Palm Drive, Atria Park District (Road between MO2 Annex and The Avenue, Smallville Complex), Mandurriao, Iloilo City. Daily events start at 10:00am onward. Dialysis sessions start at 9am everyday. Clinic hours is from 7am to 9pm. For inquiries and other instructions, please call QualiMed Surgery Center in Fairview Terraces at (02) 950.8334 or (02) 962.7633. Be certain of your health…finish fast! And know if you’re fit now! Avail of QualiMed’s Executive Checkup and be done in 3-4 hours! Visit our Makati clinic in the morning and be back to work before lunch. – Detailed medical report for today’s wellness and future references. Our value-for-money ECU packages start at Php 2,950 only! For inquiries, please call QualiMed Clinic in Makati at (02) 861.0517. Worried about your GENITAL WARTS and PAP SMEAR results? Keep calm and be aware of your CERVICAL HEALTH! Trust QualiMed’s Colposcopy Diagnostic Service. Now at lowered rates for only Php 3,000 (cash out for PhilHealth members). Cost is ALL-IN with BIOPSY; professional fees included. Have your checkup done today with our Gynecologist at Room 209, QualiMed Surgery Center in Manila. For inquiries, please call (02) 708.0000.